At quarter past three on Sunday 28 November 1943, Franklin Roosevelt and Joseph Stalin finally met, face to face, for the first time. 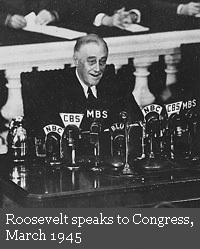 It was a meeting that Roosevelt had been anxious to have for more than a year. But Stalin had played hard to get. Even after agreeing in principle that the three major leaders in the Alliance – Churchill, Roosevelt and Stalin – should come together for a conference, Stalin had procrastinated on both the date and the location. 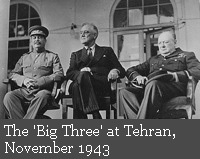 Roosevelt had suggested the three men meet in Cairo, but Stalin had rejected the idea, eventually insisting on the conference taking place in Tehran. Roosevelt had said this was simply too far away from Washington for him to come when Congress was in session. Stalin had then demonstrated his understanding – once again – of how real power works by insisting that if the meeting wasn’t held in Tehran then he wouldn’t attend. And so he forced Roosevelt to change his mind. And so, on 28 November 1943, Roosevelt attempted to ‘manage’ Stalin. He did so by first ensuring that Churchill was excluded from the meeting. This enabled Roosevelt to try and curry favour with Stalin by emphasizing how the question of India was Churchill’s ‘sore spot’ and, later, by making the extraordinary remark that India should be reshaped ‘somewhat on the Soviet line’. But if Stalin wasn’t whinging in the early encounters at Tehran – particularly during the first plenary session of the conference, which involved Churchill as well – then he was certainly complaining. Because, once again, he demanded the Second Front be opened as soon as possible, and was openly frustrated that his allies had not helped out more than they had. Stalin believed that Churchill was the main stumbling block to a Second Front, and even the British Prime Minister’s appeasement of Stalin over the future of Poland at Tehran – by agreeing the Soviets could keep the territory in Eastern Poland after the war that they had gained as a result of the Nazi/Soviet pact – did not assuage Stalin’s anger at the British. 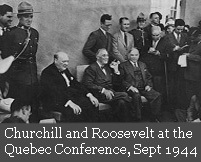 Roosevelt’s role in the dramatic scenes at a subsequent dinner at the conference, where Stalin finally demonstrated his full bitterness at Churchill, is hugely significant. Stalin accused Churchill of having a ‘secret affection’ for Germany, and announced that 50,000 German commanders sh ould be simply ‘shot’ at the end of the war.ii Churchill was outraged. But Roosevelt did not attempt to support the British Prime Minister, merely joking that only ‘49,000’ Germans should be shot. In response to this brutal teasing, Churchill stormed out of the room. But such was Roosevelt’s supreme confidence in his own ability to ‘manage men’ that there is little evidence – at this stage of the relationship – that the American President would have accepted Alanbrooke’s analysis. Roosevelt was resolutely pursuing his own agenda with Stalin – just as the Soviet leader was pursuing his own agenda with the American President. Roosevelt wanted to convince Stalin to break the Soviet neutrality pact with Japan after the defeat of Germany and come into the war in the Pacific, and he wanted Stalin to commit to supporting the new United Nations. Other matters – like the exact boundaries of Eastern European countries – were much lower down Roosevelt’s list of priorities. 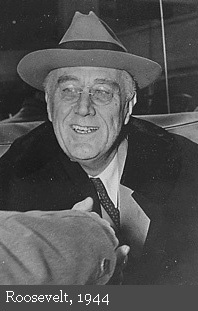 So much so that Roosevelt said privately to Stalin at Tehran that he would support the Soviets receiving eastern Poland at the end of the war, but – politically astute as ever – he said that he could not publicly endorse the plan now because it would damage his chances in the Presidential election to be held the following year, since it would alienate the Polish/American vote. For most of 1944, at least until the election in November, Roosevelt was careful to avoid discord with Stalin. It was an attitude captured in microcosm by his meeting with George Earle in the White House in May 1944. Earle had been a close friend of the President’s and, as his special emissary to the Balkans, had come to the conclusion (the right conclusion as it turned out) that the Soviets had been responsible for the Kaytn massacre. He presented the evidence to Roosevelt who dismissed it, saying ‘the Germans could have rigged things up. 'vi Roosevelt then attempted to reassure Earle about the Soviet threat. Similarly, at the time of the Warsaw Uprising in August 1944, Roosevelt was – unlike Churchill – reluctant to be drawn into trenchant criticism of Stalin for refusing to offer practical assistance to the freedom fighters inside the Polish capital. It thus seemed clear, in the light both of these political decisions and of Roosevelt’s attitude at Tehran, that the American President had decided that the future lay in a strong and positive relationship with the Soviet Union. Moreover, Roosevelt was not prepared to let, as he saw it, the relatively minor matter of practical difficulties in Eastern Europe cloud the key objective of an ongoing understanding with Stalin. This was the background to the last significant political conference of Roosevelt’s life – at Yalta in the Crimea in February 1945 (Key Moments: 'Big Three' meet at Yalta). And it’s a background that is often omitted by those who seek to see the decisions which were taken at Yalta as something new in the politics of the Alliance. 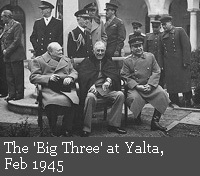 Because – in essence – all Yalta did was to confirm the key policy decisions taken at Tehran: Poland was, without the consent of the Poles, to be deprived of territory in the East – at Stalin’s request – and then compensated with territory snatched from Germany in the West; Germany would be divided into zones of occupation at the end of the war; Stalin made a series of ‘promises’ about elections in Eastern Europe, but the Western Allies did not insist on having measures in place to ensure this democratization ever took place; and, crucially for Roosevelt, the Soviets promised to come into the war against Japan after the defeat of Germany and to cooperate in the formation of the United Nations. 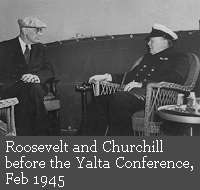 Roosevelt at Yalta was a sick man, but the decisions that emerged from the conference in the Crimea were consistent with the political policies which he had been championing for years. And, perhaps fittingly for a man whose character had been such a mix of shrewdness, charm and outright deception, Roosevelt died, on 12 April 1945, at the health resort of Warm Springs in Georgia, in the presence of his former mistress Lucy Mercer. His wife, Eleanor, hadn’t a clue that her rival was back on the scene at all. Roosevelt had played his cards close to his chest until his last breath. viii Entry for 20th May 1943 in 'Joseph E. Davies Diary', Joseph E Davies papers, Manuscript Division, Library of Congress, Washington D.C.